1 Chronicles 16:34: "Oh give thanks to the Lord, for he is good; for his steadfast love endures forever!" Psalm 106:1: "Praise the Lord! Oh give thanks to the Lord, for he is good, for his steadfast love endures forever!" Psalm 107:1: "Oh give thanks to the Lord, for he is good, for his steadfast love endures forever!" Psalm 118:1: "Oh give thanks to the Lord, for he is good; for his steadfast love endures forever!" Psalm 118:29: "Oh give thanks to the Lord, for he is good; for his steadfast love endures forever!" Psalm 136:1: "Give thanks to the Lord, for he is good, for his steadfast love endures forever." The Bible has this phrase many times within it, and in my thinking that probably means it's pretty important. 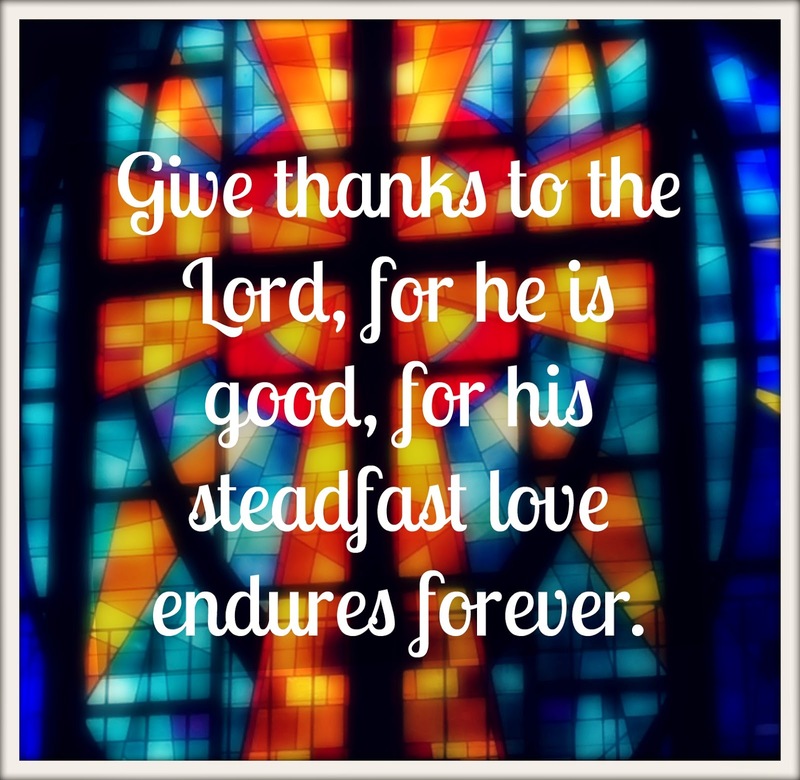 So when was the last time you gave thanks to God because he is good and because his steadfast love endures forever? I believe we thank him for our family, our health, our jobs, our temporal stuff. We may even thank him for our salvation and for Jesus. Do we ever thank him for his steadfast love, that never fails, that never gives up, that never waivers -when we don't feel it? I'll be the first to admit, when I'm going through the dark, hard places of life, that I don't much feel God's love and I certainly don't feel like thanking him. But in those times, God is still good. And He still loves us. God is faithful, even when we aren't! This past Sunday afternoon, my very willful son had pretty much zapped all my patience and grace while I was getting us ready to go back to church for the Thanksgiving service. After chasing him around the house and saying "No" and "Stop" for the hundredth time, I snapped. I smacked his bottom and yelled at him to "just be still for a minute!" Then I grabbed all the things that you have to have when leaving the house with a toddler, managed to drop a couple while trying to scoop him up- realize it's raining, go back in the house for raincoat, get back to the car, wrestle him in the car seat and finally start down the road, only to realize that there is no way I can make the 15 minute drive to church in the next 10 minutes before the service actually starts! It was once I had backed out of the driveway and turned on the Christian cd (because I probably need some Jesus right now- was my actual thought) that I just broke down emotionally. I like to call these times, "Mommy-Fail Moments" or "mommy-fails" for short. See I am not opposed to spanking my son but when I react in anger instead of just the need to discipline then I have sinned. When I yell at my son, I have lost my temper and I have sinned. And so there I am, driving to church in the rain, running late, and crying out to God and Wyatt asking both to forgive me. And it was at that moment, that low, mommy-fail moment, that I felt completely overwhelmed with the love of God. I can't really describe it to you, all I know is that I felt peace. I felt grace. I felt completely loved and completely forgiven. And I realized that though I may have mommy-fail moments, that I am not a failure as a mom. That through grace, I am made whole. My identity as a child of God, means that I am not defined by my mess ups or slip ups, but that I am a new creation. And that God, the God of steadfast love, the God that is forever faithful, gives me grace upon grace upon grace through Jesus Christ. So then my pity party turned into a praise party and as I told my husband, I had church on the way to church! My tears of frustration turned into tears of joy and my questions turned into thanksgivings! I thought about cleaning my face to make myself presentable before entering church Sunday night, but I just couldn't stop the flow of tears. I was completely overwhelmed with how awesome God is and how very lucky I am that He chose me, that He loves me, that He is God! And I realized that it's in those tough times that I truly appreciate God for who he is, and I am thankful. God is so GOOD. When was the last time you really felt that instead of just said it?